We are one of the largest retailers in the UK and probably one of the most well known brands of retailer within the UK. We have been running graduate programmes for 20 plus years in some shape or form. I suppose over the last 10-15 years those programmes have grown and expanded in line with how our business has grown and expanded. The number of schemes we offer has grown exponentially and we now have a hugely diverse number of opportunities and schemes that run across our Head Office. For example we have expanded our IT offer from business analysts to include graduates with software engineering skills. There are new opportunities that people might not always associate with a retail organisation. We want to bring people in and train and develop them to be our business leaders of the future. The University of Greenwich offers a really great and diverse range of courses for students to pursue. But whilst there is a focus on the academic side, Greenwich is one of those universities that is doing things more actively around employability with their students. Those kinds of activities really help students to focus on the additional skills that employers are looking for and are absolutely key to graduate success. There are still universities that are very academically focused but their students don’t always perform in practical ways with assessment centre tasks. It’s really useful to get insight from the Greenwich careers service as to what will work best, in which location and for which students. We need that tangible feedback, it needs to be a two-way conversation. We do take on non-graduates but the motivation for employing graduates is what you get is an individual who has had the opportunity to specialise and be educated to a really great standard. You’ve got an individual who has studied to a certain level, they have more experience than those on school leaver programmes, but they still have the raw talent to use the training programme to really develop within the business. 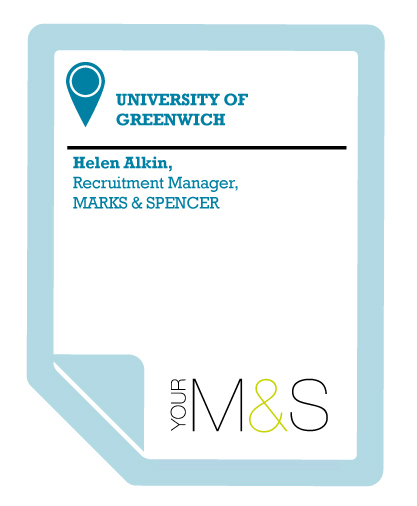 I’d definitely recommend working with the University of Greenwich, particularly if you’re looking for students coming out of university with a nice balance of academic focus with a really strong employability ethic.